The interested contemporary reader will not learn too much about the organisation from this book. The grade system is explained in one article, but besides a handful of references to rituals, there is little here that will teach you much about the workings of the Saturn brotherhood (that also contained women by the way). Perhaps this is for the better, since almost a century after the original publications, there are texts here that can still be of interest to the esotericist of today. The essays are of varied content, but there is a lot of astrology to be found within the pages of this book. Astrology seems to have been one of the backgrounds of the order. The people behind it were of the opinion that around 1950 we would go from “the ages of Piscus” to “the age of Aquarius”. When, why and what does would mean can be found in more than one text, but the order took it that they were the first esoteric order of the new age. Other astrological essays are about famous esotericists such as Paracelsus, Agrippa of Nettesheim and Eliphas Levi. Johannes Vehlow uses known information to cast a horoscope and then these elements to test his horoscope, so when we know what day a person was born, a rough chart can be calculated and then by using facts from the lives of the men, Vehlow calculates what time a person was born for example. That combined makes a horoscope which on its turn says something about the character, life and even outer appearance of the person to expand the biography. The very first essay is a complex esoteric mathematical text (the “metamathematics” that are mentioned in another text?) which is so hard to follow that I had low hopes for the rest. Most texts are (somewhat) easier to digest. Some have a heavy Theosophical leaning, some are interesting esoteric musings, some are less interesting. As you may remember from my review of Flowers’ book, there are also links to Aleister Crowley and his religion of Thelema. “Master Therion” indeed also has a few texts within these pages, he is referred to a few times and the Fraternitas’ version of the Thelematic motto is often mentioned, but I do not know Crowley well enough to be able to say if more influences are to be found in this book. 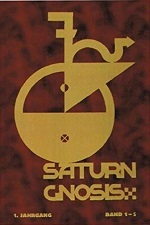 All in all the first first five issues of “Saturn Gnosis” made a nice read and I guess other people with esoteric interest would enjoy this book too.